Happy 2019! Another year, another crochet-along, even though I haven’t finished any of the previous crochet-alongs since 2015. That’s what being a mother of four will do to you though. My littlest is now almost 8 months old, and is finally at the age where she is starting to not need to be clinging onto mama 24/7. I’ve actually had a little bit of time to do some enjoyable “me” things – like fitting in a little bit of crochet. Starting with the 2019 Crochet Along. The 2019 Block-a-Month Crochet Along started in January with two 12″ squares and one 6″ square. 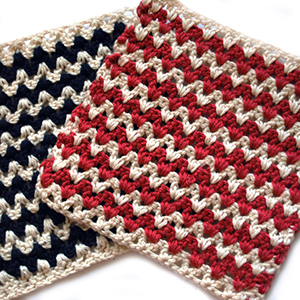 Like the other crochet-alongs (CALs) before, the group mods pick a 12″ featured square, the group votes on a 12″ filler square, and there’s an optional 6″ square. I usually make a set of four 6″ squares. I’ve been using a sport weight yarn (Caron Simply Soft) for the CALs since 2012, and so I have used a smaller hook (4.0mm, or G) for all my squares. This means that my 12″ squares usually turn out to be 9″, or if they’re a little over or a little under, I modify them to fit that 9″. I try to keep my square sizes in a multiple of 3″ so that they can all fit together like a jigsaw puzzle at the end of the year when I put them all together (like in my 2015 finished blanket here). Anyone can join in the 2019 Crochet Along! All you need is to register (for free) with Ravelry, join the group, and start crocheting! Whether or not you choose to post your finished squares, or participate at all for that matter, is up to you, and you can go as fast or as slow as you like. Trust me, I have several in progress from as far back as 2013! They’ll get done… someday! But do join in if you’ve been thinking about practicing your crochet creativity. Even when the squares don’t really excite me all that much, I try to push myself to make them as beautiful as I can, which I credit with really increasing my crochet skills over the years. So for January, the 2019 Crochet Along group started with this lovely block called Eye of the Beholder. It can be found for free at the time of this post. As my first square of the new year, this was my experimental block with this year’s CAL colors. It’s fun to see them come together. There have only been a couple of times that I’ve needed to revise my colors once a CAL has started. This year, instead of choosing them myself, I let my younger son help me select colors. I plan on making this blanket for him as a Christmas gift this year. First, lemonade (yellow) and kelly green were my starting off point. I offset those colors with mango (the light orange), and orange, which is more of a reddish-orange than straight orange. The final color, cypress, (the olive green) has unfortunately been discontinued for years. However, I bought a massive quantity of it before my local yarn store went out of stock. Hopefully I have enough for another blanket. This was a relatively easy square to start the year off, and fun to make with the front post stitches. I added a few rounds of back loop only sc edges to bring it up to 9″. So pretty! 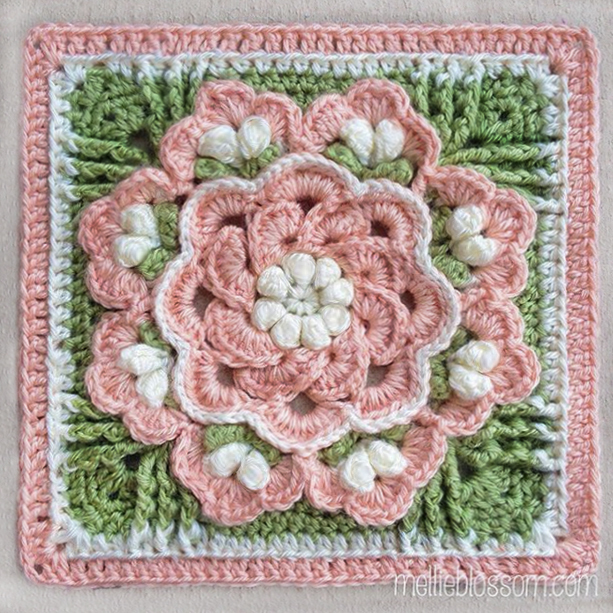 The 2019 Crochet Along group voted for the filler square and the Origami Flower crochet square was the winner. The link to the free (at the time of this post) download on Ravelry is here. It features the classic pineapple motif that crochet is famous for. I decided to play with this a little bit, color-wise, so that the center motif stood out a little from its background. I did this by using an intarsia-like technique, carrying two colors of yarn underneath each other in order to separate the clusters from the slip stitches. Even though it’s a little bit clunky (I had to awkwardly block it well to not have any yellow show through the orange stitches for the photo), I still like the way it turned out. I also added a little bit of embroidery in the center of the motif for just a little burst of red. I’m pretty happy with the results. There’s still one more January set to catch up on, the 6″ New Year’s Burst square, which hopefully I’ll be able to get around to soon. And then maybe I’ll get to the February squares before March is over… and then the March squares…. Well, one step at a time. Any crocheting is better than no crocheting!